The Roundhay Fly Fishers were on the move again. 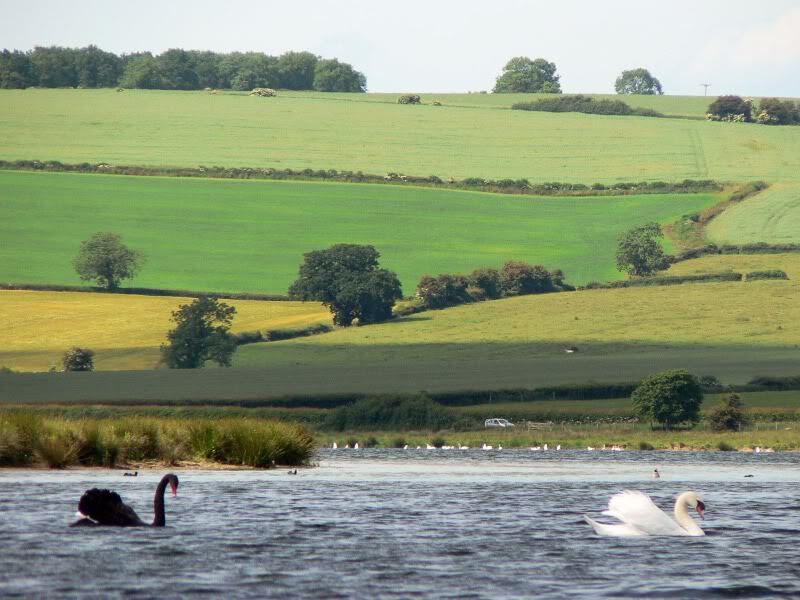 As the curtain was drawn back to reveal our latest target, there was an audible gasp – we’d been tasked with striking 2 of the Midlands reservoirs, Ravensthorpe and Eyebrook. I’d barely been back a week from Scotland and already it was time to dig the fishing tackle back out and crank up the enthusiasm. Bombed up, tanks full, we left Leeds at 0800 hours. I didn’t p*ss on the tailwheel for good luck. Maybe I should’ve. There were no teary eyed WAAFs or stoic groundcrew to wave me off but my resident mouse may have momentarily peeped out of my lounge window before returning to rooting through my cupboards. The journey down went pretty smoothly and by 10:00 we’d crossed the Northamptonshire coast without encountering any flak although Jerry had put up roadworks to slow us down on the A1, the fiendish swine. The weather was pretty rough over Ravensthorpe, high winds and relatively unseasonal temperatures. We were however full of optimism, and confident that the curse of Roundhay Flyfishers couldn’t follow us everywhere. Fools. Bloody fools. The morning didn’t go to well, I think only a couple of fish were caught between the 10 or so of us. 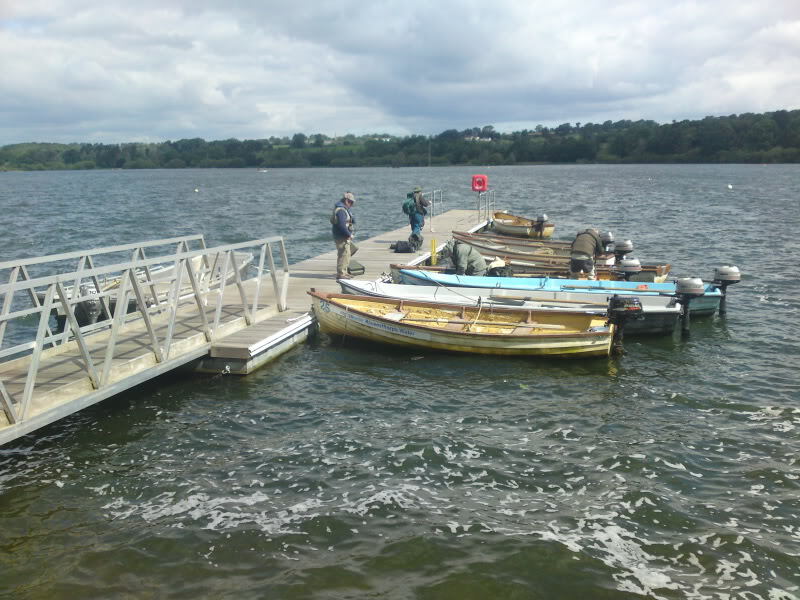 However, when we came in for lunch a boat pulled in alongside mine at the jetty. “How many you had?” enquired the man. If that was meant to boost my morale it didn’t work! 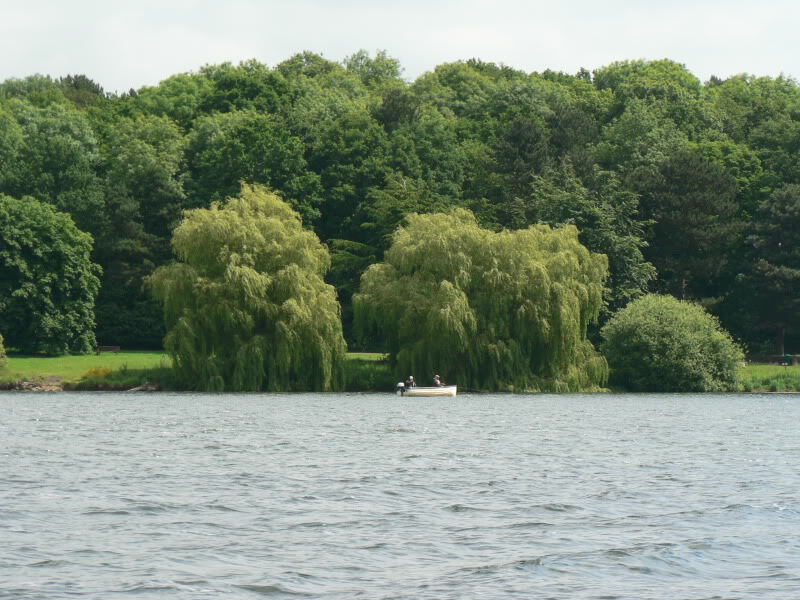 He did however elaborate on how he’d been catching, and the fact that he fished Ravensthorpe more than any other angler. It seems the washing line technique was the way forward…..27 foot leader, bouyant fly on the point then 2 or 3 buzzers/diawl bachs on 2 inch long droppers. After lunch I did try the washing line technique for a little while albeit on a meagre 18 foot leader, it didn’t do anything for me. There was some kind of hatch going on, the birds were going crackers and although it’s hard to spot them in the picture below they were actually making casting a bit difficult. I eventually found success when we anchored up at the top end where fish were steadily rising just under the surface, by chucking out the ever-reliable Shipmans. I got a couple of fish here and they were of a very high quality, around 2 pounds in weight. I also managed another fish on the last drift by fishing a goldhead hare’s ear, tucked up close against the bank. 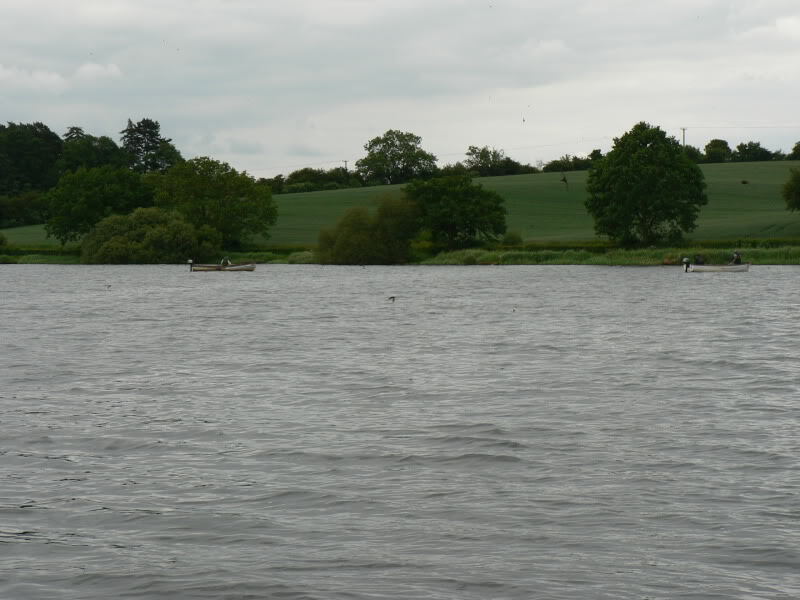 Difficult day though, most of us struggled, local knowledge really does seem to be vital on reservoirs….indeed one of our guys followed the ‘expert’s’ advice to the letter and managed several fish. 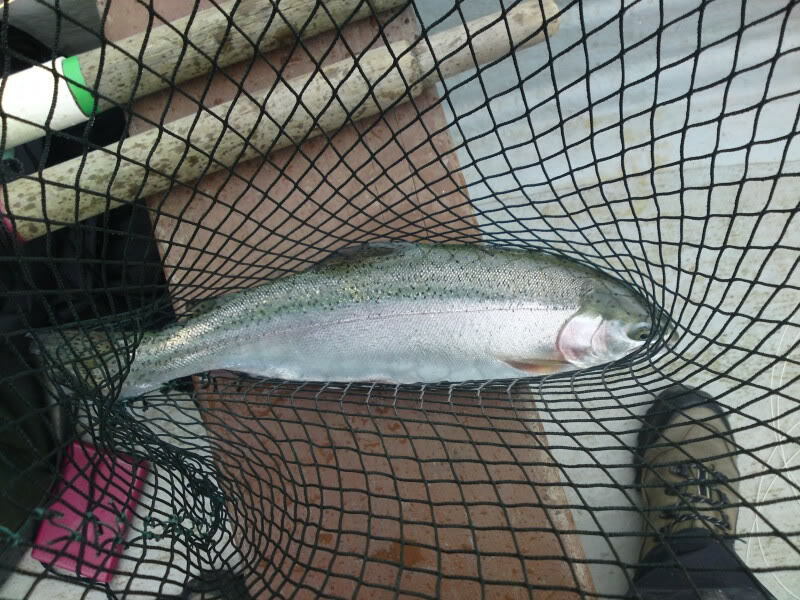 My heart still wasn’t really in it though…bobbing around on a windswept midlands reservoir, chasing stocked rainbows is very different to the beauty of Assynt. Plenty of ales were consumed at the pub we were staying at though, and the food was really good which kinda made up for the difficult day…and there was always tomorrow, Eyebrook! Remember my advice in the Assynt 2010 blog, about never sleeping in a tent after curry? Well, I’ll give you another piece of advice – never share a room with several ‘older’ gentlemen after a night on the ale because you’re guaranteed surround-sound snoring. En route to Eyebrook we receive a phone call from the lead element of our strike package. It appears that the fishing on Eyebrook has been a write off for the past 6 weeks, only 2 fish were caught all day yesterday!! They’d still bought tickets though, so we were all still committed to spending the day there now – one for all, etc. Conditions didn’t seem that bad. True, It was extremely windy in the main reservoir and intermittent blue sky, but nothing that should cause such abysmal fishing. Oh well, we already had our excuse mapped out for the day! It was another hard day’s fishing. Is it ever anything else with RFF?. 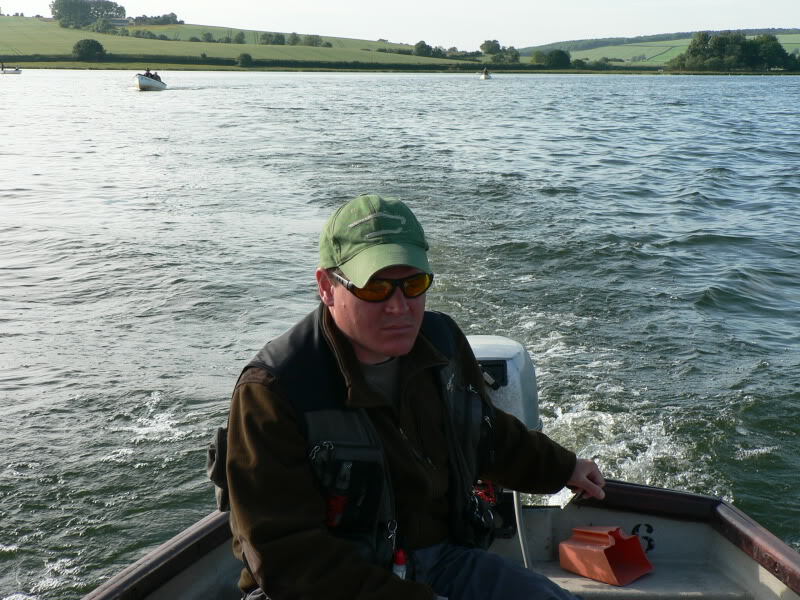 Myself and Stu motored out to the nearest bank that offered some protection from the wind and anchored up (between Sam’s Dyke and ‘The Point’) – there were other anglers there, maybe they knew something. We did see one fish landed, but that was all. Did see a black swan though…not entirely sure I’ve ever seen one before! After reconvening for a floating pow-wow with the rest of RFF, myself and Stu fished Mucky bay but didn’t get a single offer. Stu’s face says it all I reckon! I think that by the end of the day, we’d caught 2 fish between 11 of us. The fishery staff were pretty honest about everything right from the word go, so we’d known what to expect but it was still a disappointing day’s fishing. ← Assynt Fishing Holiday 2010 – y’all keep your heads down, it’s gonna be a big one..
Just wondering if you had details for Roundhay Fly Fishers? I’m very new to fly fishing (two outings with instructor) and am looking fro some guidance / people to fish with etc. Any idea best place to buy equipment as well for a new starter? 1) Sportfish . Not the cheapest but if you’re ordering online they’re one of the most reliable and have a huge range. 2) Wharfedale Angling Classics in Otley. Again, good online but even better to call in and browse for real!